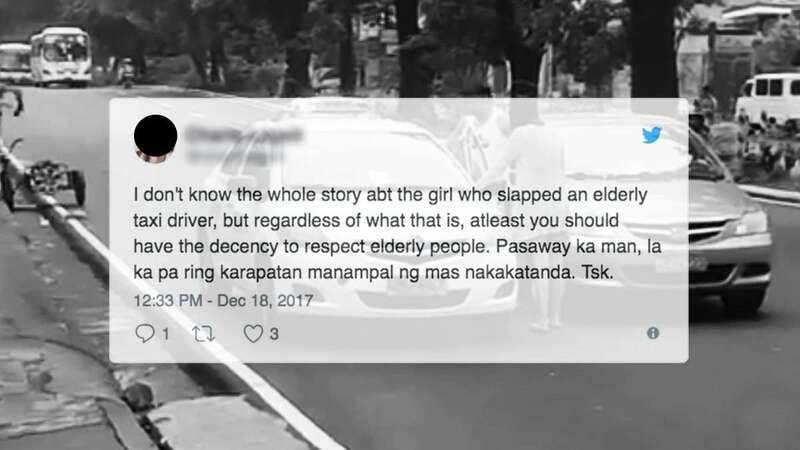 A video of a road altercation between an elderly taxi driver and a couple along Congressional Avenue in Quezon City has been making the rounds online since it was uploaded over the weekend. The short clip shows a fuming female motorist apparently hitting the taxi driver and further engaging him, even as he slowly limped out of his vehicle so he could sit on the sidewalk to gasp for air. Her male companion, meanwhile, just looked on as the whole incident unfolded. The taxi driver was later identified as 52-year-old stroke survivor Virgilio Doctor, who said he was already feeling dizzy when it happened, which could explain why he suddenly left his vehicle unattended to sit on the sidewalk. Doctor was also quick to admit that he might have angered the female motorist when he honked at them as he tried to overtake their vehicle. Because of what occurred, Doctor has decided to file charges against the female identified as Cherish Sharmaine Interior, 31. The charges include physical injury, unjust vexation, and malicious mischief.